➀ Lock button ➁ Unlock button ➂ Panic button (if equipped) ➀ Lock ( ) All doors are locked if the lock button is pressed. ➁ Unlock ( ) Driver’s door is unlocked if the unlock button is pressed once. All doors are unlocked if the unlock button is pressed twice within 4 seconds. After pressing this button, the doors will be locked automatically unless you open them within 30 seconds. ➂ Panic ( , if equipped) The horn sounds and hazard warning lights will flash for about 30 seconds if this button is pressed. To stop the horn and lights, press any button on the transmitter. 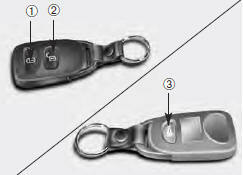 NOTICE The transmitter will not work if any of following occur: • The ignition key is in ignition switch. • You exceed the operating distance limit (about 10 m [30 feet]). • The battery in the transmitter is weak. • Other vehicles or objects may be blocking the signal. • The weather is extremely cold. • The transmitter is close to a radio transmitter such as a radio station or an airport which can interfere with normal operation of the transmitter. When the transmitter does not work correctly, open and close the door with the ignition key. If you have a problem with the transmitter, contact an authorized Kia Dealer. NOTICE Keep the transmitter away from water or any liquid. If the keyless entry system is inoperative due to exposure to water or liquids, it will not be covered by your manufacturer vehicle warranty. Operational distance may vary depending upon the area the transmitter is used in. For example, if the vehicle is parked near police stations, government and public offices, broadcasting stations, military installations, airports, or transmitting towers, etc. This device complies with Industry Canada Standard RSS- 210. Operation is subject to the following two conditions: 1. This device may not cause interference, and 2. This device must accept any interference, including interference that may cause undesired operation of the device. Battery replacement Transmitter uses a 3 volt lithium battery which will normally last for several years. When replacement is necessary, use the following procedure. 1. Insert a slim tool into the slot and gently pry open the transmitter center cover (➀). 2. Replace the battery with new one. When replacing the battery, make sure the battery positive “+” symbol faces up as indicated in the illustration. 3. Install the battery in the reverse order of removal. For replacement transmitters, see an Authorized Kia dealer for reprogramming. NOTICE The keyless entry system transmitter is designed to give you years of troublefree use, however it can malfunction if exposed to moisture or static electricity. If you are unsure how to use your transmitter or replace the battery, contact an authorized Kia dealer. NOTICE • Using the wrong battery can cause the transmitter to malfunction. Be sure to use the correct battery. • To avoid damaging the transmitter, don't drop it, get it wet, or expose it to heat or sunlight. CAUTION An inappropriately disposed battery can be harmful to the environment and human health. Dispose the battery according to your local law(s) or regulation.